Linseed oil is one of the most useful natural oils that are available. It can be used in two forms, either raw or boiled, with each providing slightly different benefits. In this article, we will be explaining what each of those are and explore boiled linseed oil uses so you know which type to use for any project you are considering it for. Linseed oil is extracted from the seeds of the flax plant. It has a wide range of uses such as preserving wood and concrete, mixed with the ingredients of paints and varnishes, and also for the production of soaps, some inks, and linoleum. The main home uses of linseed oil is for construction projects, though, so we will concentrate on the benefits for these uses. When deciding between raw vs boiled linseed oil, you need to understand how the “boiling” process changes the substance, and whether this makes it more suitable for the task you are carrying out. 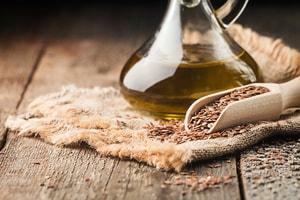 Raw linseed oil is the product you get from pressing flax seeds and not treating it in any way. It is very slow drying, water resistant, and good at preserving the material it is on. Historically, it was used as a coating on its own on things like paint brushes, ropes, stonework, wood, and within oil paint. The amount of time it takes for linseed oil to dry is a downside with some projects, so boiled linseed oil was developed. When some oils are boiled, their drying times are often affected. This isn’t the case with linseed oil, but the effects have been achieved by adding certain solvents that help it dry quicker. This “boiled” linseed oil, therefore, it dries a lot quicker. There is, therefore, quite a big difference between the two types of linseed oil and this means that the different types are suited to slightly different roles. The first thing to be aware of is that boiled linseed oil contains all of those chemicals needed to improve drying time. So, if you’re interested in linseed oil because it is a natural product, then the boiled version should be avoided. Raw linseed oil is great for preserving wood and stone, but it can be tricky to use in comparison to the alternatives. The main problem is the drying time and, if added too thickly, in the cold, or onto wet material, it may not even dry at all. Instead, it will remain sticky. It can take weeks to fully cure, so is only really practical to use on things that are in the open where drying time is not important, such as gutters or chopping blocks. If you’re choosing between boiled or raw linseed oil for oil painting, though, you’ll find that raw oil is the best type to use because the extended drying time allows for the paint to level itself before drying, which results in a smoother finish. If you are looking to coat furniture to preserve the wood, on the other hand, then boiled linseed oil is a much better choice. This is because it will dry a lot quicker, so the furniture will be ready to use and won’t need to be left alone for a few weeks before anyone can touch it. Other time sensitive jobs will be better done with boiled linseed oil too, like tool handles and outdoor flooring. Modern day preservatives protect wood from far more than linseed oil is capable of, so it’s worth bearing in mind the things that you won’t be protected from after using linseed oil. UV Light – Many preservatives can block the effects of UV light. It’s what causes the most problems with wood, and can lead to discolouration and damage to the wood fibers, which allows other problems like fungus to take hold. Mildew – Rather than preventing it, linseed oil (like most vegetable oils) can increase the growth of mildew because it isn’t a denatured product. Hardening – Linseed oil does not harden so won’t provide any physical resistance to knocks and scratches. Removal – Linseed oil can be quite tricky to remove from a surface because it stays sticky and gummy. If you are looking for a natural oil to preserve outdoor items with, then linseed oil could be a good choice. It’s also ideal for using as a base for oil painting. Boiled linseed oil uses are wide and varied, significantly reducing the amount of time required to let it dry by adding a few solvents to the mix. Both types create a lovely warm colour and nice texture and, while it doesn’t protect from as many issues as modern day alternatives do, it’s often half the price of the alternatives and a great way to preserve items in a cost effective way.